Dozens upon dozens of reasons exist for pets’ scratching. All of them are covered in this dermatology textbook. Pet owners call us almost every day with questions about flea control, when fleas are only a part of the problem. The conversation usually starts with, “My dog (or cat) is scratching and I need to know what you have to control fleas.” Many owners believe that flea bites are the only reason pets scratch. Fleas are not the only reason you might scratch, and it is no different for your cat or dog. 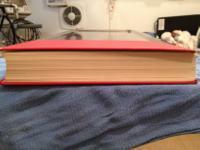 This dermatology textbook on skin diseases of dogs and cats is 2 inches thick. Trust me when I tell you there is a lot more information in there than just flea control. Dozens of conditions cause pets to scratch and each requires a unique treatment to make the patient better. Your pet’s doctor can make a specific diagnosis and institute specific treatment for the cause of your pet’s misery. Click here to read how to determine whether the amount of scratching you are observing rises to the level of abnormal. That said, let’s spend some time today talking about the fundamentals of flea control. To the non-allergic dog or cat, a bite from a flea is very nearly a non-event. 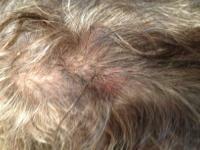 Your pet is not going to lose hair and make sores on himself from a small number of fleas. Conversely, the dog or cat with Flea Bite Allergy can be itchy for up to a week with only one bite from one flea. Click here to read more about Flea Bite Allergy. Bathing is not part of flea control. Even if you use an insecticidal shampoo, when you rinse off the shampoo, you rinse off the insecticide. The flea-control product you use needs to remain on the pet if it is going to continue to kill fleas. No one uses “dip” for flea control in the 21st century. There is no way that prescription flea control products can “not work.” By prescription flea control products we are referring to Revolution (which is also heartworm preventive), Comfortis, Trifexis (which is heartworm preventive, intestinal parasite preventive and contains Comfortis flea control all in the same pill) and Advantage Multi (which is heartworm preventive, intestinal parasite preventive and flea control all in a topical form). If you are seeing fleas in the face of proper and monthly use of these products, you have fleas in the house, yard or, more likely, both. Continue reading for control methods. All of these prescription products kill fleas by circulating in the blood stream and killing adult fleas that feed on the host’s blood. They do not repel fleas. Fleas that feed on the pet are disabled within two hours and will die within 24 hours. Any fleas you see on your pet treated with one of these products have either 1) just arrived and have not yet fed, or, 2) have fed and will soon be disabled then dead from ingestion of the flea-control medication. Fleas get on our dogs and cats just long enough to ingest a blood meal and lay their eggs, then they leave. The rest of the time they are in your carpet, rugs, furniture and cracks in the floor. The flea-control product on your pet cannot kill those because it’s in your pet, not in your furnishings. Therefore, fleas will continue to get on your pet to feed. You must treat the source of those fleas, and it’s not your pet unless you are not using effective prescription flea control. Most over-the-counter (OTC) flea control products suffer from short duration, insecticide resistance, or both. “I don’t have fleas in the house. I know, because I am not being bitten. So, the fleas must be in the yard.” If you have fleas in your yard, you have fleas in your house. Fleas, like most parasites, are very species-specific in their host preferences. The ones that like dogs and cats don’t care for human blood, and will feed on you only as a last resort if they are close to death. The only exception is the occasional person to whom fleas are attracted. Treating the yard can take two forms: short-term fast and long-term slow. If you need to kill the fleas in the yard right away, use a pyrethrin, permethrin or organophosphate spray suitable for outdoor use. Read the label! Keep your pets off of the yard for the prescribed time period. If necessary, treat the front yard and let the pets continue to use the back yard until the off-limits time has passed. Then, alternate. Before the yard spray loses its effectiveness, usually about a week with most products (if no rain), apply a granular form of yard treatment. We have enjoyed good success with Bayer Advanced Triple-Action Ant Killer (don’t be misled by the “ant” label. It is an insecticide and, thus, will kill fleas very effectively). Ortho’s Bug-B-Gone is also very effective. Both are available at home improvement stores’ garden centers. This little dog was presented for a flea bath. In fact, however, he has Flea Bite Allergy and was in need of medical attention for the problem. Most important of all: If you have done all of the above steps to the letter, and your pet is still scratching, please make the poor miserable creature an appointment so that his veterinarian can give him some relief. Hello Dr. Randolph: We have a Rag Doll cat whose long hair seems to protect fleas from being eliminated by Advantage or any of the other medications. I checked with a local PetSmart store about purchasing a flea shampoo and interestingly enough, the young lady suggested using ” DAWN” dishwashing liquid which she says kills fleas instantly. She uses it on her own pet, but she has a dog and we were wondering if it would be safe to use on a cat. I know it has been used on oil-soaked birds with no ill effect. Would appreciate your comments on this with many thanks for your input. Colleen, on the subject of Dawn cleaning oiled wild animals, consider this: These are heavily-stressed individuals who are in danger of dying from a toxic agent and have little to lose. Therefore, the agent that can most quickly remove the toxin with some degree of safety and allow rescuers to move on to the next individual is the ideal thing to use. Your kitty is not in that situation. There are many, many safer and more effective agents. One of the problems with Advantage is that it’s a fairly old molecule, and some fleas are resistant to it. Also, you may have fleas in the house and yard contributing to reinfestation, even if the Advantage is killing the fleas. My suggestions: 1, as stated in the article above, don’t think of bathing as part of flea control. 2, Treat the house and the yard and follow the guidelines I’ve laid out above. 3, Consider switching to Comfortis, a prescription flea control given orally that avoids the entire “thickness-of-hair-coat” issue. Other options include Revolution and Advantage Multi. 4, The latter two products will also give your precious kitty protection against heartworms, a deadly parasite of cats. Click here to read about heartworm disease in cats.